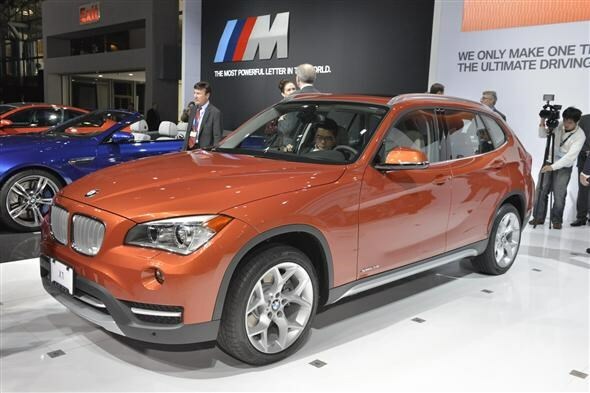 The revised BMW X1 due for launch in the UK in May was unveiled at the New York International Auto Show today. Not much has changed: indeed, it’s extremely difficult to tell it apart from the current model. Inside it gets newly designed surfaces, some extra chrome detailing, a shallower centre console, glossed air vents and more polished controls but that’s pretty much it. On the exterior BMW says the new car takes its styling cues from X models higher up in the range. The twin circular headlights have been changed and now there’s a chrome-coated accent across the top. Meanwhile, an LED accent light – included as part of the optional xenon light package, complete with LED light rings for the daytime driving lights have been added. A crease line rising steadily to the rear of the car and more prominent wheel arches, as well as more pronounced side skirts are also part of the refresh. Side direction indicators are now integrated into newly designed exterior mirrors. At the rear, the bumper and underguard have been changed and the reflectors have been repositioned. Also the reflectors are now bordered by surfaces painted in body colour. As a result, the black plastic elements are slimmer, while the silver-coloured underguard is arguably more striking. There’s no word on the engine line-up but it's likely to remain the same as the current car. To see the full BMW X1 review click here.